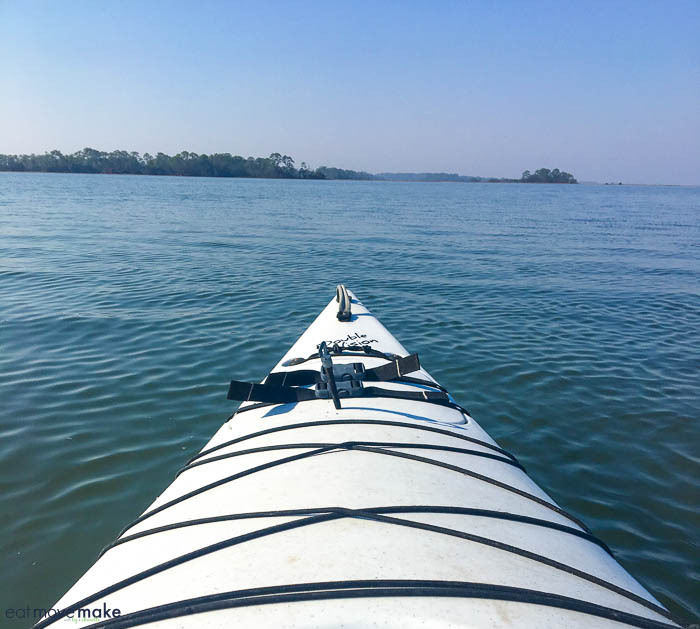 I had the pleasure of going kayaking in Fripp Inlet when visiting Beaufort, South Carolina, and there’s simply nothing better than gliding quietly through the water with a paddle in hand. It’s the ultimate relaxation. Fripp Inlet lies between Fripp Island and Hunting Island, and it’s all part of the Sea Islands, a tidal and barrier island chain. 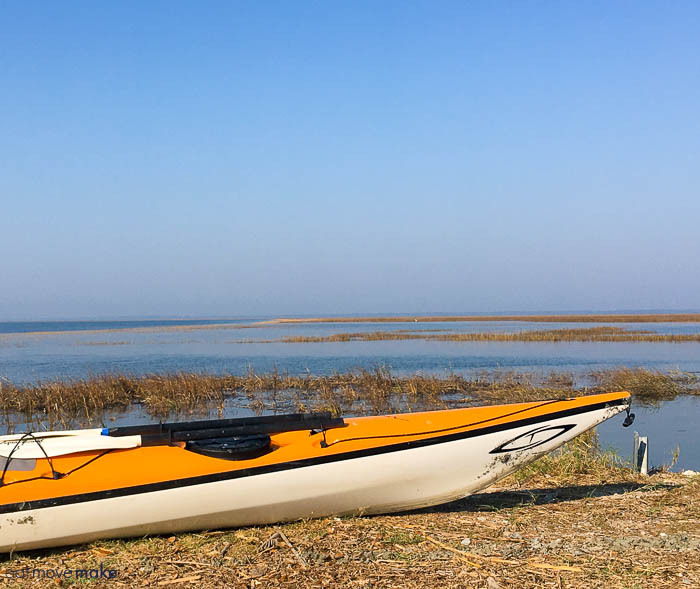 If you’re familiar with barrier islands, you probably know that there are huge expanses of salt marsh inside them, and that means kayaking! We took a guided tour with the very laid back and friendly Eric Gibbons of The Kayak Farm. 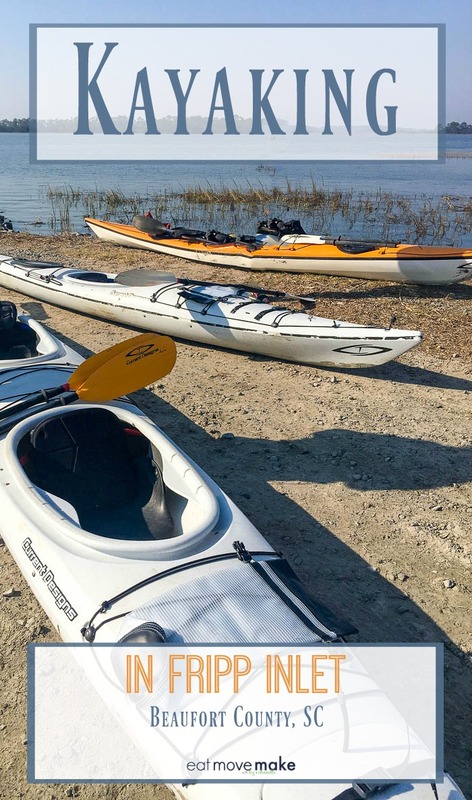 While the bulk of his business is simply kayak rentals, he does guided tours upon request. Eric let us paddle at our own pace, and periodically we would meet up at certain areas to chat a bit. He shared some really interesting facts about the marshland habitat and about dolphins (because we saw a TON of them). Since it was so quiet and peaceful while kayaking in Fripp Inlet, we could hear dolphins breathing every few seconds. Pretty amazing! 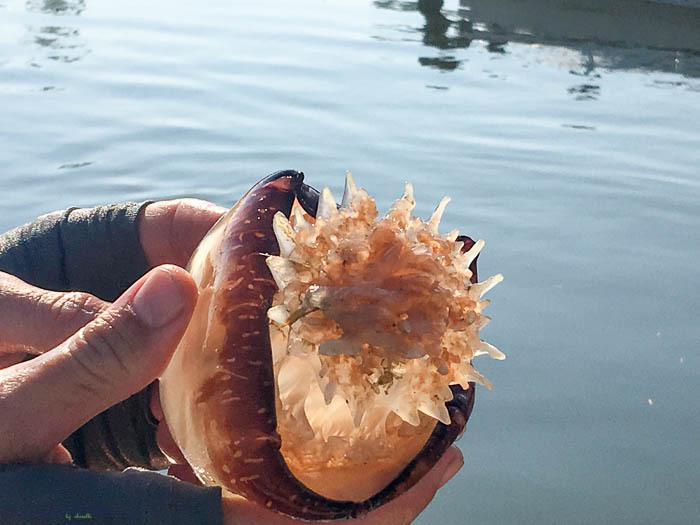 Eric also spotted a cannonball jellyfish in the water, and let us have a closer look before sending it back on its way. Apparently, it’s one of the most common jellyfish, but the stingers are so small, that they can’t really hurt you. Still not touching one… just saying. Eric also told us about the grasses that make up salt marshes. 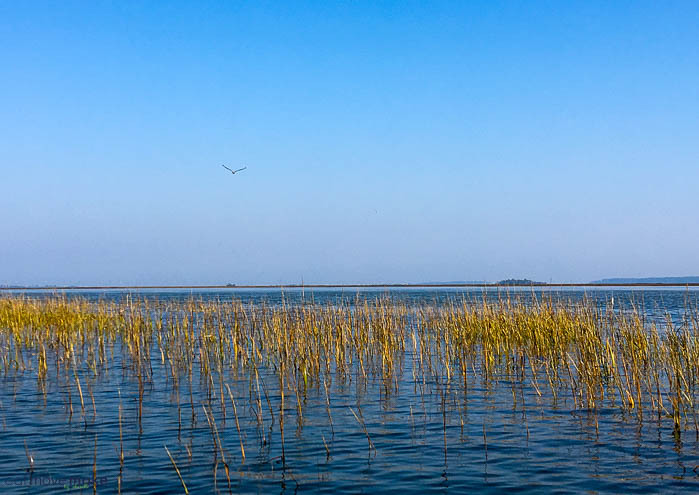 The shorter grasses are found closer to islands in the higher marshes, and the taller smooth cordgrass, called Spartina Altonaflora, is further from shore. What I didn’t know is that it’s a deciduous perennial, so in the spring, new growth pushes up and knocks the old growth into the water where it breaks down into nutrients (making the perfect habitat for shrimp and oysters). It’s also a rhizome with subterranean stems, so what looks like lots of plants is actually one plant! 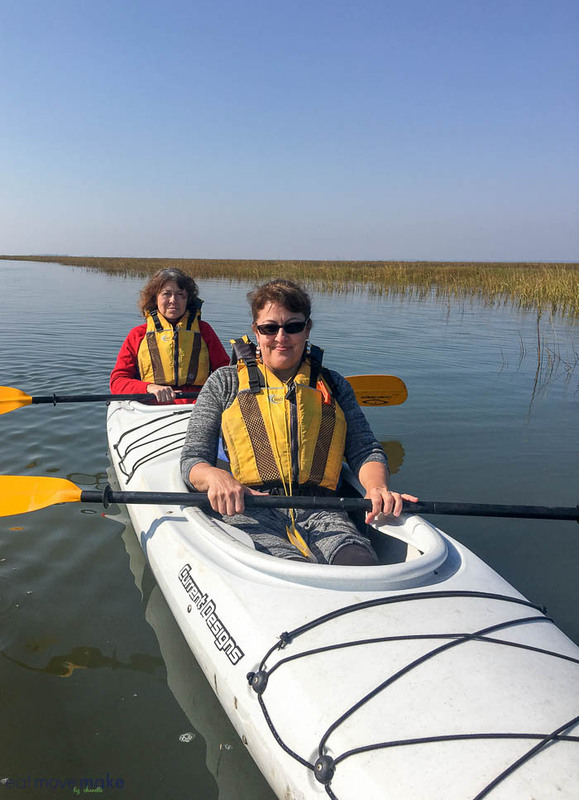 My friend Pam and I opted for a tandem kayak so we could chat while we paddled. It was really fun, but there’s one thing to note. They’re even more stable than single kayaks, but there’s a price. They’re super heavy, and even though two people are rowing, it definitely takes a lot more effort to move them through the water. 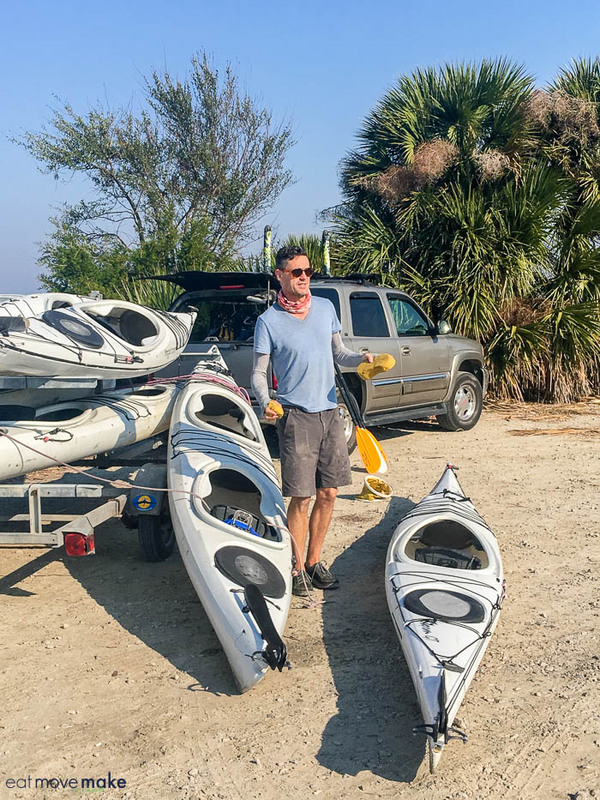 If you’re visiting Beaufort, kayaking should be on your must-do list, and I highly recommend kayaking in Fripp Inlet. It’s such a serene, natural and unspoiled place — great for the soul. This sounds fun. I can’t wait for the summer season to come. The Kayaking looks like a great time! What an awesome little jellyfellow, fantastic photo. I havent kayak’d since I was 11 in summer camp. This looks like it would be fun at Fripp. I always loved kayaking, it’s such a peaceful thing and allows you be active right in nature. We also go ocean kayaking, that’s so fun!!! I have never been kayaking before. Hubby is wanting to do something new and without the kiddos. This might just be what we end up doing. My brother went kayaking here in New York State last year and he loved the experience. I don’t know if I would be too afraid to do it. I live in SC and had and opportunity to review a Kyak but I am too chicken. I’m scared of any water except bath and pool water. What a beautiful thing to do! I’ll have to try to find time to kayak the next time I’m in that area. Kayaking was one of my husband and my favorite pre-kid activities. It’s been years and years since we’ve gone out. It looks so gorgeous, especially with all the cool plants and creatures. Kayaking is very fun to do! We always do that when me and my hubby are on a trip! its a great bonding! We LOVE kayaking! It looks like your kayaks were much longer than ours! Were they 12-footers? I have never heard of a cannonball jellyfish before–that’s so neat! Our family has never gone kayaking but has always wanted to. It looks like it’s such a fun adventure and what a gorgeous spot to do it in! Kayaking is one water activity you will not find me doing! In turn my daughter is obsessed! When she visits FL from college, that is the first on her list. Fripp Inlet looks like the perfect place! I have done some kayaking before and find it to be relaxing. You went to a neat destination and looks like you had a lot of fun. This looks like a great place to kayak. My husband and I are always looking for new places to take our Kayak. SC is a bit far, but next time we are in the area, we will check it out. This is right up my family’s alley! My husband would be so thrilled if I showed him this! What a beautiful, peaceful time! We are going to myrtle beach in 2 months, I need to see how far this is from there. I love visiting the Beaufort area when I get the time, but I have never gone kayaking. I think I will have to check this out the next time my husband and I make the trip. I have never been kayaking but it is definitely on my bucket list! Did you find it difficult? Looks like a ton of fun! I wouldn’t touch one of those things either! I’ve never been kayaking, but people I know tell me it is so much fun. Maybe I should give it a whirl! This looks like a wonderful way to spend the day. I definitely would prefer to share with a friend even if it was harder work. I had no idea that there was such a dolphin population there. I would love that. Kayaking looks like it is tons of fun but unfortunately have yet to dabble into the mystery of it. Hope to one day get the guts to do it; so adventurous! Fun, especially in those gorgeous surroundings! I kayaked with my husband in Jamaica and it was a lot of fun! I remember being surprised by the arm workout I got from paddling. What a beautiful place to be pending time. You look like a pro at it. You look to be having a fun time. i am always afraid of flipping those things over. I was definitely sore after kayaking. My hands were pretty torn up too, but it was worth it. It was a really neat experience. This looks so neat. My friend loves to kayak and would probably have so much fun there. Kayaking looks like so much fun and I am sure it’s a great workout. Look at you out there smiling away, glad you enjoyed this! What a great way to get your workout and see the surroundings with dolphins thrown in there. Fripp island and inlet look beautiful and Beaufort is looking more and more like a place I have to go to. This looks so fun! I have always heard amazing things about Fripp Island! Kayaking is such a fun thing to do! I have not tried kayaking before but I think you’ve convinced me to. Fripp Inlet looks beautiful and I love that there is an option for a guided tour! I love kayaking – it’s one of my favorite activities to do. We haven’t done it in a while since we moved to TN, but hopefully we’ll move closer to a body of water in the next few years! We want to go kayaking one day. It looks like a lot of fun. Great pics! That sounds like so much fun! I have always wanted to try kayaking. Oh, now this is something I’d love to do! What could be more calming than paddling in such a beautiful, peaceful place . . .
Wow, what a great place to visit. 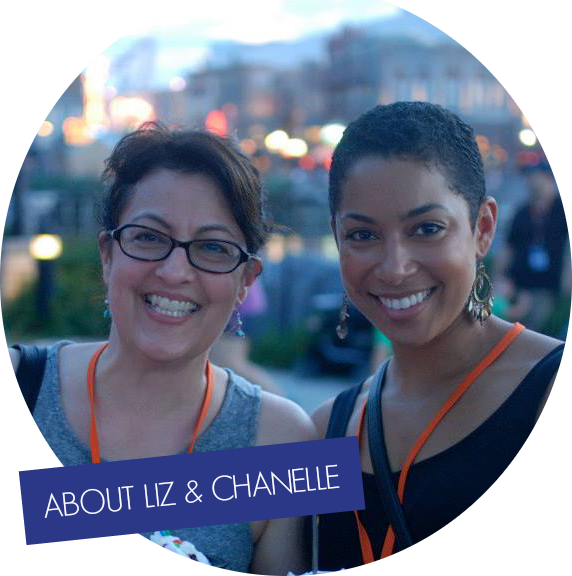 It is so nice that you had someone to share such great information with you. I think I would go with the tandem kayak also. I like to chat! It looks like a beautiful spot to kayak. I would love to learn how to kayak someday. Good exercise too. How fun! No matter where we go on vacation, if kayaking is an option, we do it. Fripp Inlet looks like a ton of fun. It’s been a long time since I tried kayaking and it would be nice to do again. I love the peacefulness of the place, it’s lovely! For me, there is always a first time. And if I do try my hand at kayaking, I would want it to be at Fripp Inlet!